The Lick Observatory on Mount Hamilton is reducing its Visitor Center hours due to budgetary constraints, closing the center for three days a week from Monday, March 7, through Wednesday, May 25. The Visitor Center will remain open Thursday through Sunday from 12 noon to 5 p.m. It will be closed each week from Monday through Wednesday, starting Monday, March 7. During the summer, from Memorial Day (Monday, May 30) through Labor Day (Monday, September 5), the Visitor Center will return to being open seven days a week from 12 noon to 5 p.m.
Based in Lick Observatory's historic Main Building, the Visitor Center offers free public tours and operates the Observatory gift shop. The Visitor Gallery of the Shane 120-inch Telescope will remain open daily from 10 a.m. to 5 p.m.
Lick Observatory is a research facility of the University of California multi-campus research unit in astronomy, the UC Observatories/Lick Observatory (UCO/Lick). 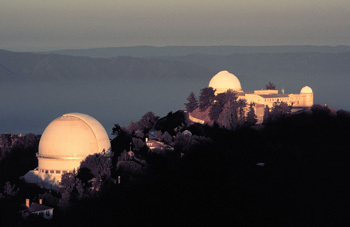 Headquartered on the UC Santa Cruz campus, UCO/Lick operates the Lick Observatory and the UCO Technical Labs at UCSC, and is a managing partner of the W. M. Keck Observatory in Hawaii. Lick Observatory, established in 1888, was the first major mountaintop observatory and continues to be an important research site.